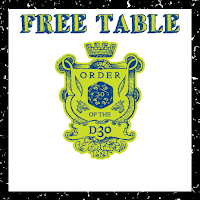 New Free/PWYW d30 Table is now Available! I did finally finish this d30 Coinage Generator that was just a seed of an idea a couple months ago. For this one I actually did some research that ended up with me fiddle-farting around trying to make some ideas work out right. This generator assumes a standard size and shape for the main/base coin and the 1st table generates the coin's alloy and Standard Value (SV), where a SV of 1.00 is equal to one gold piece (gp). Additional tables create denominations and may even alter the base coin. They include modifiers to the SV for any changes or denominations made. One thing I personally find amusing is that this table doesn't actually duplicate results/tables from another d30 Coin Generator from New Big Dragon Games Unlimited, which I already have and didn't actually consult when planning this out. To me that was just a happy coincidence, but for you, dear reader, you might want to click on that link above because those tables work well with this generator. 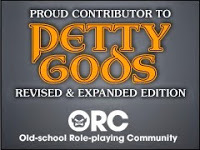 Like usual, you can click on either graphic to do to the appropriate DTRPG page, or you can use this link.